Did you know that I can hear what plants are saying? This is one reason why I hate weeding (besides the fact that it is hard work): it feels cruel and unfair. I hate the sight of all those babies gasping and shriveling in the sun. When I prune I have to steel myself against the protest. Once when Ryan chopped off a big wild grapevine, the sight of that gaping, dripping stump was dreadful to me, like someone bleeding. 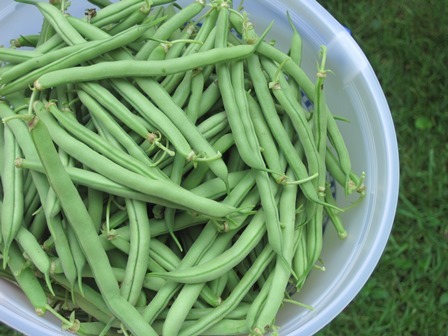 The other day I was out in my garden picking green beans. As I pulled the long straight pods, I was sure (quite sure) I heard the plants sighing with relief. Left alone, the beans would turn fat and woody, aging idly, sapping strength, corking the usefulness and life span of the plant. Removed, they cleared the way for fresh energy to surge into the blossoms and new beans coming on. The plant found it was still young. Productivity endured. They were delighted to give; I was delighted to receive. I thought to myself—this is how I should think of good deeds. Sometimes I get exhausted with my works, as though I have to produce enough of them to stretch around to the needs of all. Instead, I should be producing them because that is what I do—fueled by internal design, not external pressure. I am a bean plant. I make beans. And when someone comes along and picks them to enjoy, I can release them with a sigh of relief. Whew. Thanks for taking that. I needed to cook a good meal for someone. Ahh. Lovely. Thanks for giving me an opportunity to babysit. I’ve been growing that one quite a while. Thank you for letting me throw you a party! Now I can start cooking up the next one. If you’re feeling useless and stuffed up, clear out some of the overripe projects, the things you’ve been meaning to do for others for a long time—or you’ll soon find you have stopped concocting the fresh. For women who claim to be devoted to God should make themselves attractive by the good things they do. For women who claim to be devoted to God should make themselves attractive by the good things they do. For women who claim to be devoted to God should make themselves attractive by the good things they do. I agree. It is Bible so it is true. BUT I also like this quote when I get too hung up on “doing”. Somewhere there is a balance between being a “human being” and a “human doing”. Thanks for writing this. It gives additional clarity to the question of conserving/creating energy (conserving energy by saying no, which sometimes can turn into a downward spiral by reaping less and less energy). I’ve thought about it a lot and your comparison puts different words to it. And I agree about releasing some of the overhead that gets involved in doing or not. Could it be that there is a reciprocal relationship between doing and being, just as there is between being and doing? I think so. Habits and rituals are watch words for me right now; I believe they form me to a greater degree than I used to give them credit. I hear the bugs talking: “No, please don’t kill me. My mother is expecting me home.” And I haven’t found a way to redeem the fact that then I just kill them anyway.